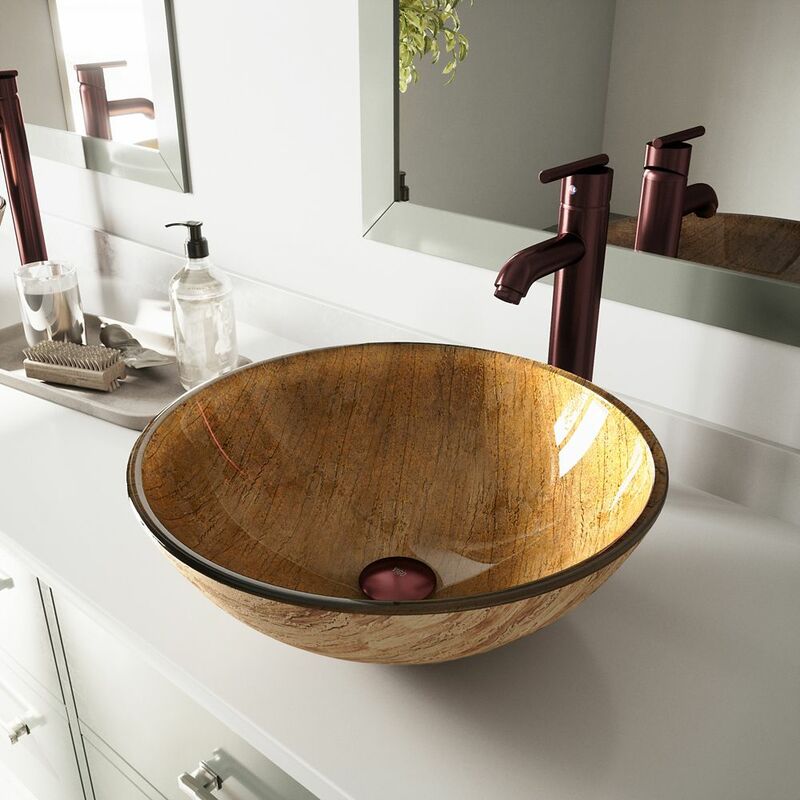 Glass Vessel Sink in Amber Sunset with Faucet in Oil-Rubbed Bronze is rated 4.7 out of 5 by 89. Rated 5 out of 5 by Denise from I love my new sink and how it fits in... I love my new sink and how it fits in the design of my new bath! Rated 3 out of 5 by Winnie from Beautiful vesel sink Faucet peeling. Sink/faucet cost too much to be peeling. Love the product but has flaws. Rated 5 out of 5 by Shelley from The Vigo Amber vessel sink and faucet is beautiful in my bathroom. The quality is excellent and ... The Vigo Amber vessel sink and faucet is beautiful in my bathroom. The quality is excellent and the price was great. Rated 4 out of 5 by Kev from The sink is beautiful and easy to install. The only thing we didnt like was the color of the fau... The sink is beautiful and easy to install. The only thing we didnt like was the color of the faucet that came with it. It was far more red than oil rubbed bronze and did not match the other components of the bathroom. We had to spend extra money to replace it with a matching faucet.